And a playable deck of cards created by "Alyss" to battle the imposter "Alice." This is a book for fans of fantasy and of the bestselling "ology" books, for Lewis Carroll scholars, and especially for young girls in search of a fresh, new, princess story. 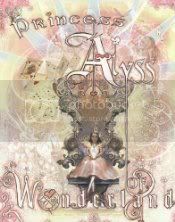 Since I'm on a roll of finishing what Looking Glass Wars books I own, I decided on a quick reread of Princess Alyss of Wonderland, a "scrapbook" kept by Alyss during her early years with the Liddells. It keeps with the assumption that Princess Alyss of Wonderland was actually lost in our world, and it is being presented here as a historical document, backing up the claims of the "historians" trying to shed light on the fact that Charles Dodgson got Alyss' story completely wrong. The book is well presented, reading very much as if a young child wrote it. I felt there was a little discrepancy in the story though; in The Looking Glass Wars, Alyss eventually gives up her search for Imagination and decides to live her life out as Alice, having finally come to terms with the fact that she would never be going home to Wonderland and that it would be best for all involved if she adapted to life with the Liddells. However, in this book, it appears that she discovers an Imagination Sphere that was given to her by Bibwit Harte, and she takes it upon herself to practice exercising her imagination with the help of the sphere. To me, this just seemed too contradictory to the way the story is told in The Looking Glass Wars, but since this is supposed to be a lost artifact from her time with the Liddells, I suppose that not all the facts could have been presented in the main series. Or, as I suspect is actually the case, I'm just reading far too much in the book and not just taking it for what it is, a bit of fluff. For more information, visit the Looking Glass Wars website.